LAFM: How is next season looking for you and your team? It is looking decent. We have a very young team and we are full of potential. LAFM: What was your best season? My junior year, which was last year, I had the most touchdowns of any year. LAFM: Current height and weight? LAFM: Who is your football idol and why? Steve Smith is my favorite player because he is only 5’9 and he plays WR in the NFL. HE continues to make great plays. LAFM: How old were you when you started playing and where? I started playing when I was 6-years-old at Kings Grant Playground. LAFM: If football doesn’t work out, what do you see yourself doing? Have you thought of a major? I see myself doing Athletic Training or Physical Therapy. LAFM: What positions are you being recruited for? Which is your favorite position, why? Cornerback is my favorite position, but I think I am best at receiver and I would rather be recruited there. LAFM: What schools are recruiting you, and do you have any favorites yet? 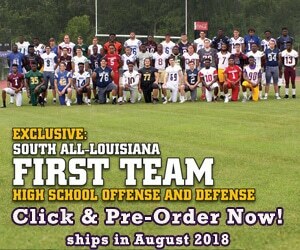 ULL, McNeese St., Nicholls State, Southern, Louisiana College.